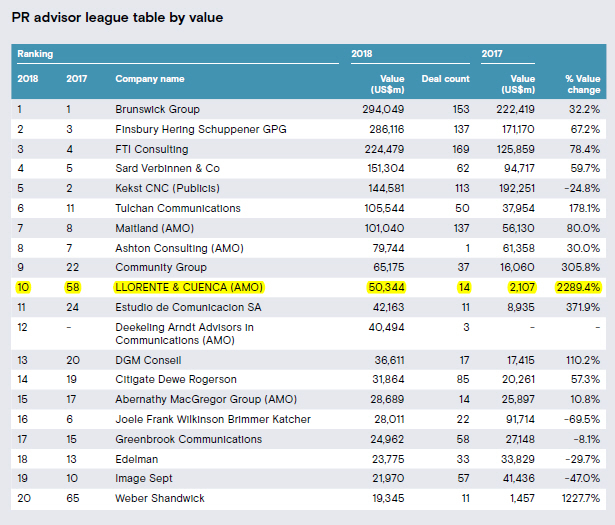 LLORENTE & CUENCA, the leading public relations, communications and reputation management consulting firm in Latin America, Spain and Portugal, again leads the prestigious PR advisor league tables in Spain by deal value, according to data analysis agency Mergermarket. 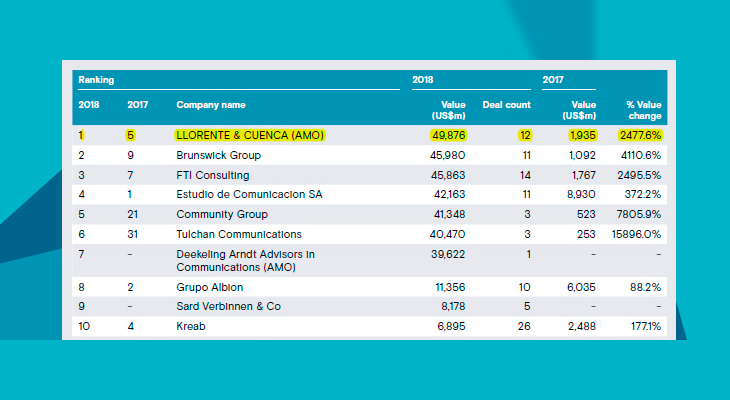 It was the top PR agency in Spain for mergers and acquisitions (M&A) by deal value in 2018, consolidating the top position it occupied since the first half of the year, and rising from its 5th place ranking in 2017. 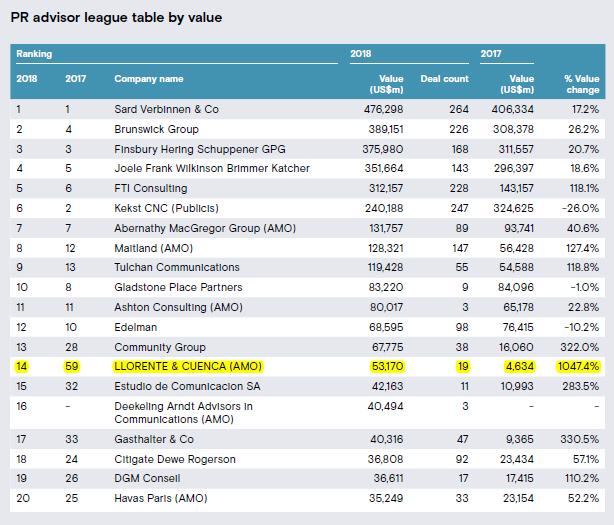 In the European ranking, LLORENTE & CUENCA was 10th by the value of deals it advised on while on the global list it rose to 14th, in both cases representing the first-ranked Spanish agency. 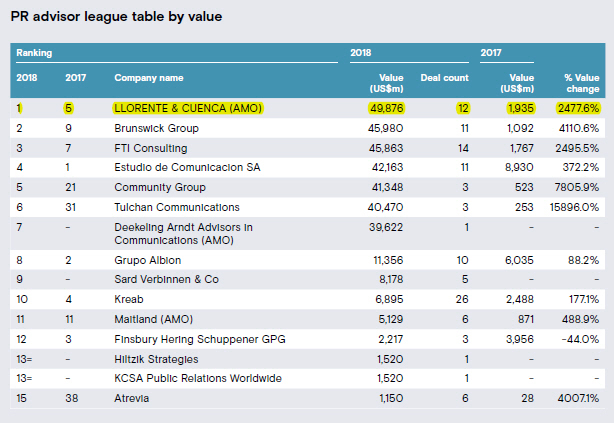 Six of the agencies comprising the /amo network, of which LLORENTE & CUENCA is a member, are also among the top 20 worldwide: Abernathy McGregor Group (7th), Maitland (8th), Ashton Consulting (11th), LLORENTE & CUENCA (14th), Deekeling Arndt (16th) and Havas Paris (20th). The combined value of the deals advised by these companies puts the /amo network on the 2nd position worldwide with deals worth a total of 397 billion dollars and the network ranks 1st by deal count. LLORENTE & CUENCA advised last year on a total of 19 operations valued at 53.17 billion dollars. In Spain it retained first place with operations valued at 49.88 billion dollars. The financial communications team led by Jorge Lopez Zafra has advised on communications for the most important corporate transactions in Spain in 2018. Among the most important were advising Atlantia in its bid for Abertis, as well advisory work for NH Hoteles on the bid launched by Minor Group of Thailand for the Spanish hotel group. The team also worked on Globalvia’s acquisition of share packages in Itinere owned by Kutxabank and Abanca. “We have a team highly specialized in M&A, with global capacity for action thanks to our membership of the AMO network. Once again, our results show that LLORENTE & CUENCA is the leading consultancy in advising these operations and we hope that next year we will continue to increase our presence in this type of corporate movement”, said José Antonio Llorente, founder partner and chairman of LLORENTE & CUENCA.